Julian Roberts is the inventor of a pattern cutting technique called ‘Subtraction Cutting’. This basically means doing the opposite of traditional methods of garment construction. This is done by cutting huge negative holes through the sheets of fabric, after construction this should allow the body to move freely in the hollow space. The subtraction technique was publically introduced in 2004, under Julian AND Sophie label for spring/summer 2004. For this collection Julian & Sophie used their creativity making together 10 dresses in one day by using subtraction cutting technique. There were no drawings or designs to take inspiration from. All they had were long tubes of bright red cotton, which they cut and manipulated to create beautiful garments. 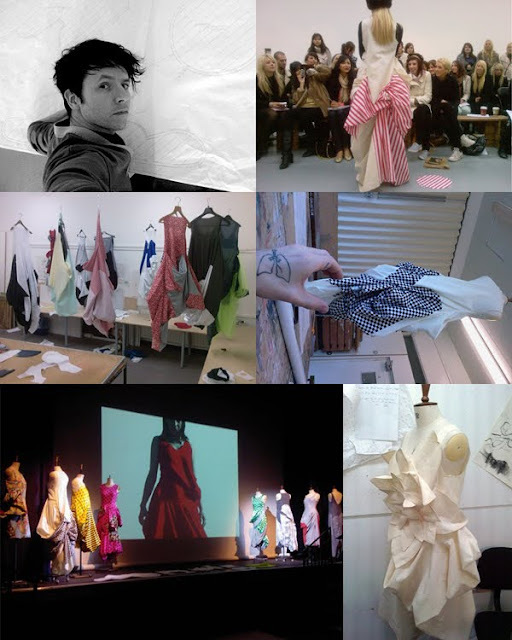 Instead of taking ownership of his new invention to pattern cutting Julian has demonstrated is subtraction cutting technique to fashion and textile students internationally. Julian states ‘You could easily learn in twenty minutes, and have an elaborate finished dress to wear by teatime!’ because the technique is simple enough for everybody to learn, you do not have to deal with lots of fraction and measurements that get in the way of being free to experiment and make mistakes. You can be surprised with the outcome of the shapes created as its only reveal after construction. This quote can be found on his website: www.julianand.com under the heading to wrongs make a right PDF File.